Dollar Discovery! On September 10, 2015 I opened an envelope dated April 30,1962 that Mother sent me in college. I had read her letter then, but did not open the Bossler Mennonite Church bulletin where she had tucked a dollar bill (series date 1957) until now. I wonder now whether she was testing to see if I had taken the time to open the bulletin she enclosed. When I opened the bulletin commemorating Church College Day, a few weeks ago, out tumbled a “Silver Certificate” dollar bill backed by REAL money, not the “Federal Reserve” bills we carry around in our wallets nowadays. What was going on in the world in April 1962? US district Judge J. Skelly Wright ordered the desegregation of elementary schools in New Orleans, LA. John Kenneth Galbraith, then U.S. Ambassador to India, wrote a letter to President Kennedy proposing a negotiated peace between North Vietnam and South Vietnam. At the Ealing Jazz Club in London, Brian Jones was introduced to Mick Jagger and Keith Richards. The three would become the heart of The Rolling Stones. Walter Cronkite replaced Douglas Edwards as the anchorman for the CBS Evening News. What was happening in the Longenecker house then? There are two references to money in this letter, three if you count the dollar bill I didn’t discover until now. I don’t remember what the check was intended for or the amount, but it was probably not enough for books or tuition. And seldom did Mother write a letter that didn’t mention a menu or food preparation. I know now that she equated food with love. And she knew that money, even a little bit, would sweeten my passage through my college days too. God bless the memory of my mother, who knew the value of a dollar . . .
. . . and the appeal of a home-cooked meal! Did this post prod memories of happy surprises about money or food? Join the conversation here. What a sweet post about your mom! It’s lovely that you still have the letter. Perhaps finding that dollar now and prompting such memories is more valuable than the actual money would have been then. You are absolutely right: “Perhaps finding that dollar now and prompting such memories is more valuable than the actual money would have been then.” I would have pocketed the dollar and then used it in the snack shop. I wouldn’t have know then that I would be recalling college days on a blog or remembering my mother as such a force for good. What a wonderful surprise! It is like a visit from your mom. In those days a dollar would have gone far. I have a few letters from my mom too which are very special. She also equated food with love as did her mother and grandmother. We always left with a care package when ever we visited. I remember commenting once as an adult, “You do know that I can afford groceries, mom.” We both laughed. She continued to send food home with me, mostly home made of course. Have you heard the now cliched expression? “You can give without loving but you can’t love without giving.” That principle certainly applies in both our cases. I suspect too that you are giver when you visit family. I had not heard that expression but I love it! Yes, I do tend to show up with a goody package, usually books, and often a treat. My daughter loves it when I travel and bring edible items back for her. What a wonderful memory of mom. How I miss her. In all the three years that Nikki has been away to college I have never sent him a letter. Reading this post shows me the loss of that beautiful art. Text messaging easy calling and quick pay. This is last year. We’re so proud of him. I’m making a point to send him a heart felt letter. Thank you Marion for your post to remind people like me the value of a heart felt letter. Nice how you saved your letters. What a nice surprise awaiting for Nikki! Yes, I did save some letters from college. I have some letters Mom sent to Florida too, but haven’t gone through them yet – or even found them. They’re somewhere in a drawer! Next on my list . . .
Nice to see you in this column again, Gloria! I wonder: Can you make sausage rolls in Thailand, Carol? I guess you have a vicarious experience on Skype – ha! I’m still imagining how thrilling it was to find that dollar bill. Clearly, you had NOT looked at the bulletin. You would have been thrilled to find it then, also, but in a very different way. And you would have spent it. Right? Yes, I probably would have spent it at the snack shop – maybe for an orange crush, my favorite, and that probably wouldn’t have cost a whole dollar either. On our way over to Landis Homes to see Aunt Ruthie, I see the turn off to Stauffer’s Market, where you learned the value of a dollar and then some. Of course, I remember reading about your experiences there in BLUSH. Lovely memories. How great to have those old letters. I don’t have any that my parents sent when I was first away from home. Well, you do have the memories that, judging from your latest posts, are still vivid. Thanks for commenting here all the way from Australia, Linda. What a wonderful surprise! I think I would just frame the dollar bill: it must be simply irreplaceable! Well, Fatima. I’m not exactly sure what to do with it. Right now, it is sitting on my kitchen window sill looking back at me with mystery. Surely I won’t spend it after all these years. Framing is one idea. Thank you! Great post, Marian. Our family knew the value of a dollar, too. I worked year around to cover my own college expenses, but during the school year when I was at college, my folks sent me $20 a month. I was always proud to make it to the end of the month and still have some of that $20 left. You probably heard the expression “We came up the hard way” growing up. Maybe it was hard, but it was also simple and good. Words to live by! So many treasures are hidden in the letters received from loved ones of days gone by. I find it so sad that letters are no longer a form of communication and that my children will have few (if they even save them) to remember the people and events of their lives. I cherish my mother’s letters, as it is clear you do as well. Her handwriting alone brings a warmth that only the love of a mother can generate. My mother was not perfect, but she too knew the value of a dollar and of a kindly written word. Thanks for sharing a piece of your history, Marian. Your words always touch my heart. Yes, letters are almost as hard to come by as LP records and land-line telephones these days. Thank you for your kind and generous words, always appreciated, Dorothy. I know you appreciate your special Mom and know that each moment must be cherished. Food=Love=Nourishment, what mothers do! Thanks, Joan. You summarized beautifully the facts and feelings I remembered as I composed the post. You’re hired – ha! This made me think of the letters I sent to my kids when in college (even though they had email) just because they too always loved to get letters + money. I would send whatever I had on hand whether $1, 2, 5 or maybe a real surprise with more. I always figured it would brighten their day. To have your day brightened 45+ years later (??) how very special! I think it would have made me cry: 1) that I didn’t open it back then, and wondering if she wondered, but hesitated to ask, if you got it, and eventually forgetting about it; 2) glad/happy that I didn’t open the bulletin, so it would be a gift from beyond; and 3), totally nostalgic. I truly doubt that she did it to check if you bothered to open the bulletin. That you didn’t open it then leaves me thinking 1) you were bored and not interested and thinking oh there goes Mom again making sure I’m kept in the church loop; or 2) in a rush and a bit absentminded thinking you’d open it later. And you did! At LEAST you didn’t throw it away! Fun stuff. Wonder what a dollar bought in 1962? What a detailed answer! You must be an editor, Melodie – ha! 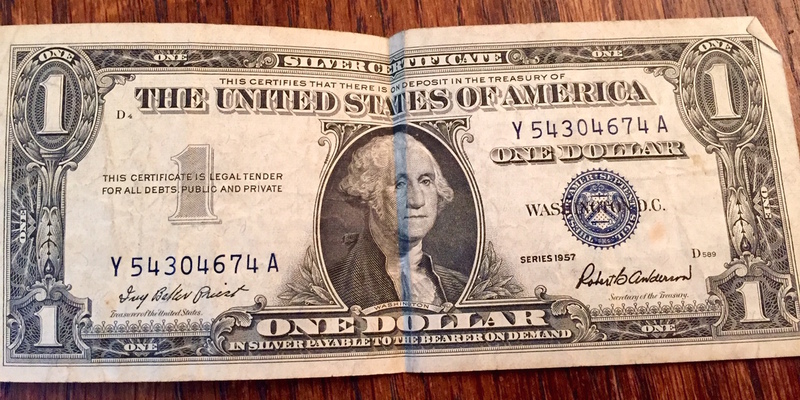 Your comment prompted me to check on the value of a dollar in the 1960s. This is what I got from Ask.com: “A dollar really went far in the 1960s — much farther than it does today. Before you get too nostalgic, remember that the median household income in 1967 was $7,143, and the minimum wage was $1.40 per hour. Of course, on the other hand, that same year, an average American home cost $24,600, and a Love Bug (a Volkswagen Beetle) could be had for a mere $1,500.” A later comment mentioned that you could send 20 letters for a dollar in 1962. I was probably too busy keeping up my A average, so I read the letter very quickly and overlooked the church bulletin and its hidden treasure. Anyway, that’s my guess, Melodie. I don’t remember getting bills with such large denominations from Grandma, but I do remember her calling the money she sent “cabbage leaves.” Dear Grandma Fannie! I love the way your mother’s messages keep coming, and I thank you for sharing them with us. My mother’s major life work centered around the gardens, the cellar and canning jars. She often shared canned items with me when I came to visit. I recently found a box of large canning jars–the size for grape juice. I still can, but I mostly use quart jars. So, I didn’t want to keep these large jars, and I was happy when I found someone to pass them on to. My sisters and I took most of Mother’s canning jars to MCC Gift and Thrift Store, but I have one of her vintage blue Ball jars with the bubbly glass sitting on top of my dresser. We come from similar stock, Dolores. Thank you for sharing your memories here. Fascinating post, Marian! You did a wonderful job of tying in the dollar bill, the bulletin and your mother’s possible plan with all the other details of the dates. Who can top such a story – amazing, Marylin. What an inheritance! We have Bibles galore retrieved from Mother’s house. The hundreds-year-old German Bible has been bequeathed to the Center for Pietist Studies at Elizabethtown College, but there are at least a dozen other Bibles accumulated over time from various generations. Bibles are somewhat like flags – there is a certain gravitas to them that requires special attention. We haven’t checked all of them yet for $$$ – ha! Marian — I’m so glad you didn’t find and spend that dollar bill way back when. Clearly the emotional interest it’s gained over the years is a valuable treasure trove. It’s like your Mom (whom I’ve grown to love through your posts) has reached out and touched you. Yet again, another reminder that she loves you. Food memories associated with mom: pigs in blankets, shepherd’s pie, “porcupines” (meatballs with sticky-outie rice), and the BEST “haystack” cookies in the world (Chinese noodle mounds covered in melted butterscotch). Mother would be absolutely shocked and amazed at her fame – while she was alive and now posthumously. She loved and lived the simple life, which I think is part of her appeal in our complex world. Thank you for enumerating your “Mama” food memories. I notice they all have connotations of rural life – animals and even a haystack in the mix. Ha! Mother made porcupines when we still lived at home and in her last years, shepherd’s pie because it could be fixed ahead of time and baked later. Ahhhh that is the sweetest story ever . My aunt , who was my mum s sister , used to say …there is is no one quite like your mum . I often think of those words . You had a doting aunt in your pocket just like my Aunt Ruthie, who supplemented what Mum could do for us. You comments are always a delight to read because I hear SO much enthusiasm in them. Gee, thanks, Cherry! Well,I guess your mother knew you never read the bulletin or you would have thanked her for the dollar . My mother sent me a $5 bill every week in a letter from home. I lived with an aunt and uncle while I was in college, one of my father’s brothers. My parents called every weekend. If I happened to not be home, they chatted with the relatives. You are right about the bulletin-dollar scenario. I never looked inside the bulletin, and mother may have forgotten she sent the dollar. It’s hard to say. Your parents showed their love too with their weekly phone calls and $$. We were both fortunate to have such support. Precious memories! Marian … What a wonderful surprise to find that dollar your Mom sent. Her correspondence is filled with love and motherisms – about the job awaiting, etc. My Mom often included recipes and quotes in her letter to me. I’m glad that I hung onto many of them because they are sweet reminders of her and my growing up years. I agree – the detail gets lost, lost in the shuffle. 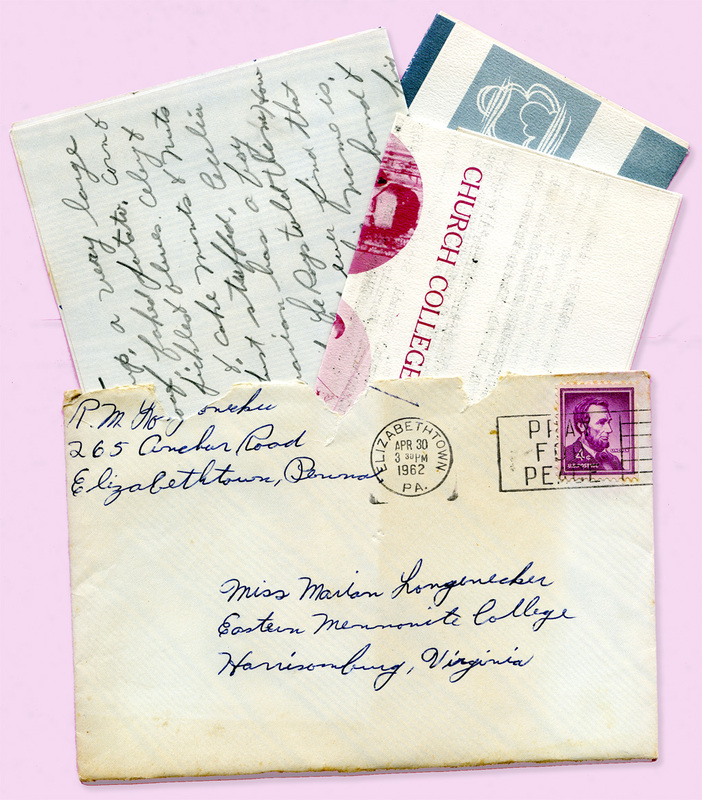 I detect so much love and care in my mother’s letters now – details that I missed when I sped through the lines of her letters as I galloped on to the next “important” thing during college years. Lucky women, you and your daughter, people I detect who have the good sense to value these motherly lines. Very sweet and loving to look into your relationship with your mom. Thanks for the glimpse, Marian. I love sending gifts to my sons. It was a revelation when my Italian mother-in-law gave Vic and me gifts of money, not a lot, but it was a big help. 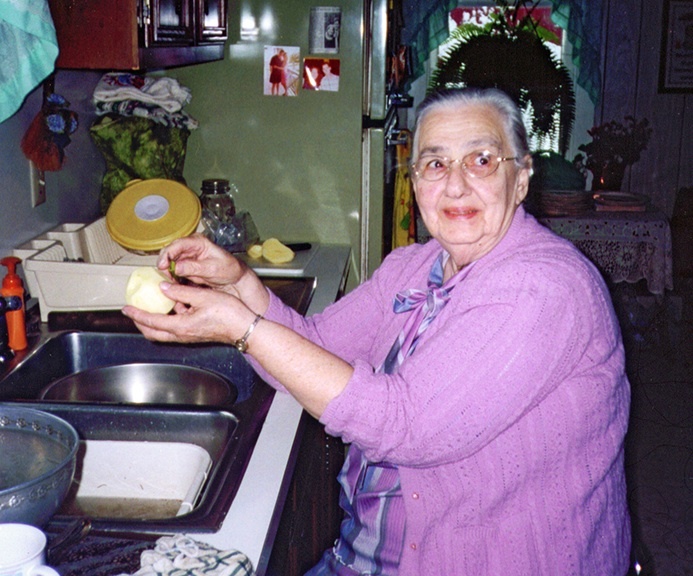 She also taught me how to cook Italian food from the garden, the backbone of how I cook now. My earliest college freshman year letters to my mother (she saved them, so I know) were filled with pleas for money to pay for books or other necessities and pleas for letters from her telling me how she was doing with her new Air Force teaching job in England. I had a full room, board, and tuition scholarship, but had imagined she would help with other expenses until I got settled. She didn’t and I soon quit asking, but it still hurts to remember how my mother ignored me rather than being honest about her intentions. Giving is always an extension of love and I enjoy reading how you and your mother-in-law have given and still give exuberantly. Yes, your mother sounds a little tight-fisted here, especially since you explicitly stated your needs which she could easily have satisfied, given her teaching job in England. Who knows what rationalization went on in her mind at the time? Still, she did save your letters. You are a writer – more grist for the mill – one way to look at it. I’m glad you enjoy these vignettes presented with the patina of time. At the time, I felt the struggles both at home and at college. In retrospect though, I can see the charm. As for this dollar, according to the sources I have checked, it has more sentimental than real value because it is not collectible for silver unfortunately. So glad I came to this albeit late Marian! Loved the comments too. Money as metaphor for energy is the way I see it and when e.g. given with love is even more powerful. I love coming by money unexpectedly – and I can only imagine the memories that arose when you came across the dollar bill. Thank you for this post! You have been a very busy lady, Susan, so I don’t consider your comment tardy in the least. Your insights are always welcome! Money=love; Food=love . . . there are so many variations to the equation, but the bottom line is LOVE! When we are young we skip over so much and don’t recognize love in its various guises. When we get older it finally sinks in – ha! Well, there you go! Our daughter went to college in Jacksonville, FL where we live, so no correspondence was necessary there. However, when she and her hubby moved to Chicago I got letters and notes. (No cellphone) Now that she and her family are back in our hometown, it’s phone calls and texts – I hate texting and would rather have a phone call. Wouldn’t you? Yes, when I was gathering info about the 1960s, I too felt a wave of nostalgia for the good old days, but wages/salaries were a lot lower then too. Thanks for reading & commenting here, Rebecca. I paid a visit to your blog before commenting here. Very attractive – and I can tell you write with heart and mind. Thank you too for the follow. I hope you visit here often – I post once weekly on Wednesday!